Hi there! 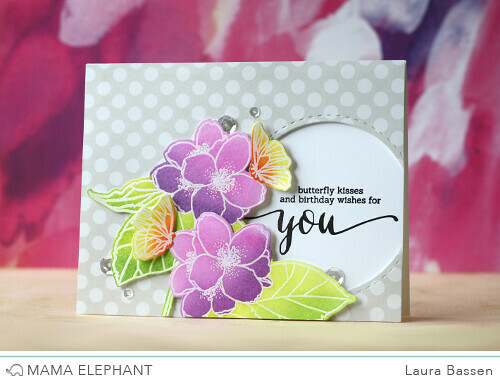 Laura here and today I have a project featuring the beautiful new Butterfly Kisses stamp set along with the coordinating creative cuts. 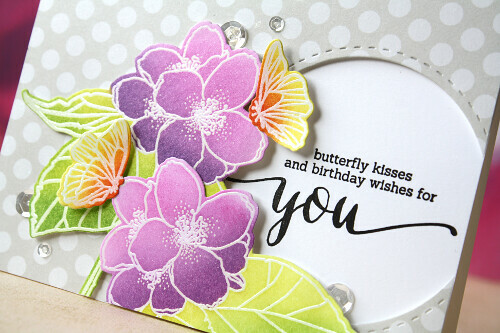 I embossed the blooms in clear and blended in some Tutti Frutti, Eggplant, Lemongrass & Mojito pigment ink. For the butterflies I used Sunshine, Orangeade & Apple ink. I used the circle die from Pizazz Pieces to create a frame for the sentiment. Here's a video to show you how I created this card. Lovely floral image; going on my wish list. Wowza! 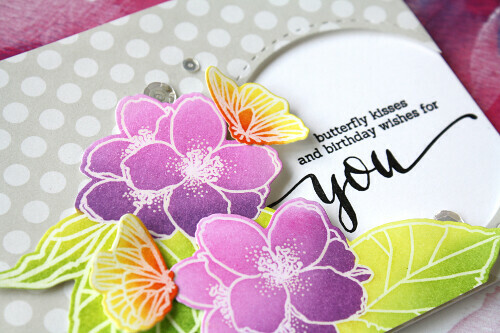 As always, totally love your coloring with this lovely stamp set! Stunning! I love this stamp set and the colors you chose are perfect. Holy Moly! This is gorgeous, Laura! Bravo!!! Such pretty colored flowers and butterflies! Great video as well as beautiful card! Such a gorgeous card! Love those pretty butterflies with the splashes of orange!